Innovation is seen as a key ingredient for successful cities in the 21st century economy, as new technologies constantly emerge to disrupt the status quo. The idea of an “innovative city” can cover a broad range of different styles, sectors and outcomes. It can refer to a city where commercial breakthroughs by world-famous multinational companies occur, or where groundbreaking research is carried out by universities and the public sector, or the places where new ideas are created by startups and entrepreneurs. 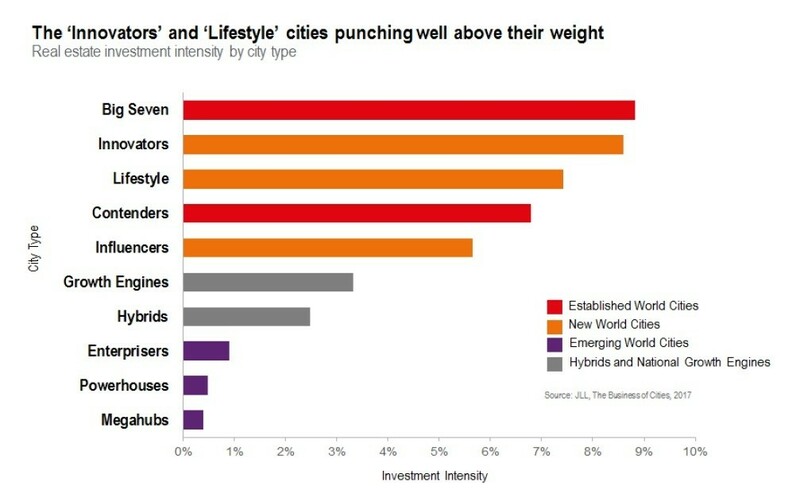 To help understand the global system of cities, JLL’s Cities Research Centre has identified 10 city “types”. Cities within the same category possess a shared DNA with other cities in the group, having similar characteristics, opportunities and challenges. The “Big Seven” global cities – including New York, Tokyo and London – are the core of this system, and possess strong all-round offers in the modern economy. These are the cities traditionally associated with innovation, home to multinational corporations, a wealth of talent and clusters of world-class universities. However, mid-sized cities and cities in emerging markets are also establishing themselves as sites of innovation, carving out niches for themselves in the modern economy. These two groups have been nicknamed the “Innovators” and the “Enterprisers”. In recent years, a group of mid-sized cities, mainly in Europe and the US, have become specialists in the knowledge and high-tech sectors, gaining important positions in global networks of innovation. Fittingly, we call these the Innovators. These relatively small cities are gaining a distinct edge over many of their peers as the economy shifts towards technology and research-oriented industries. Often, these cities attract interest from internationally mobile talent and businesses, due to the perception that they lack many of the negative externalities (for example, lack of affordable housing, environmental problems) of many larger rivals. However, while these cities share characteristics, that’s not to say that they have all taken the same pathway to innovation. Universities, corporations, the public sectors and entrepreneurs all drive innovation in different cities, but each example shares a critical mass of knowledge and expertise. • Austin provides a mix of cost, culture, talent and business environment benefits that has led to the small city becoming one of the US’s key technology hubs. The major presences of the University of Texas and Texas State University underpin the city’s strong talent pipeline which, along with business-friendly policies, have attracted the likes of Dell, IBM, Amazon and Facebook. It has gained the nickname “Silicon Hills” due to the high concentration of technology firms, as well as its position as the leading US metropolitan area for start-up activity in 2016. • Berlin has become a magnet for cosmopolitan, international talent, based initially on its low housing costs and cultural scene. 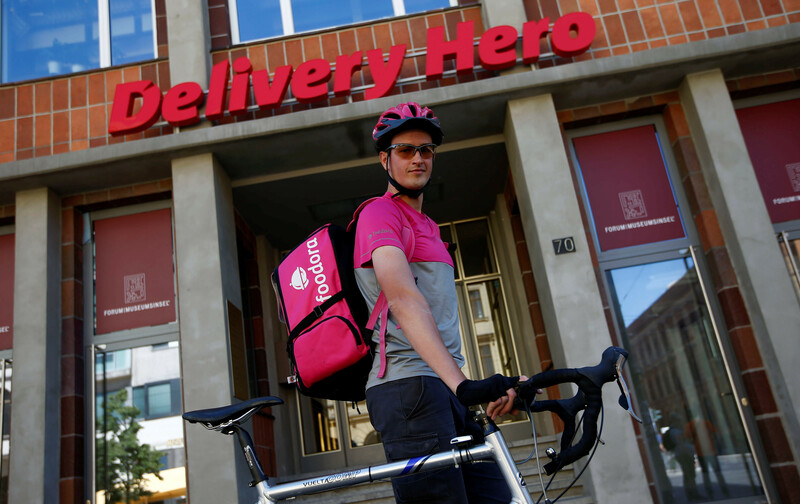 The city is developing its own startups, with Rocket Internet spawning a network of successful companies, including online fashion site Zalando, food delivery service Delivery Hero and HelloFresh, a food box provider. In 2015, Berlin attracted more venture capital funding than either Paris or London, demonstrating Berlin’s ability to compete with larger cities. • Boston’s strengths come from its position as one of the world’s leading higher education hubs, home to two of the world’s top three universities (MIT and Harvard). This exceptional talent pipeline and research strength means that Boston has emerged as a leader in a number of scientific fields, notably biotechnology and the life sciences. • Stockholm has become known as Europe’s “unicorn factory”, thanks to its track record of producing $1 billion-plus companies. Only Silicon Valley can outperform the Swedish capital in terms of unicorns per capita. Music streaming service Spotify and Candy Crush Saga developer King Games are two of the city’s successful start-ups. This is underpinned by Stockholm’s exceptional digital, transport and public service infrastructure. Investors have recognised the long-term ingredients of success that many of the Innovators possess. Of the 10 city types, they have the second highest level of investment intensity (ie real estate investment as a proportion of economic size), behind only the Big Seven, which includes the world’s most popular real estate destinations. Innovation isn’t just about established cities in developed economies. Increasingly, cities in emerging economies are becoming key hubs in global networks of innovation – referred to as Enterprisers. 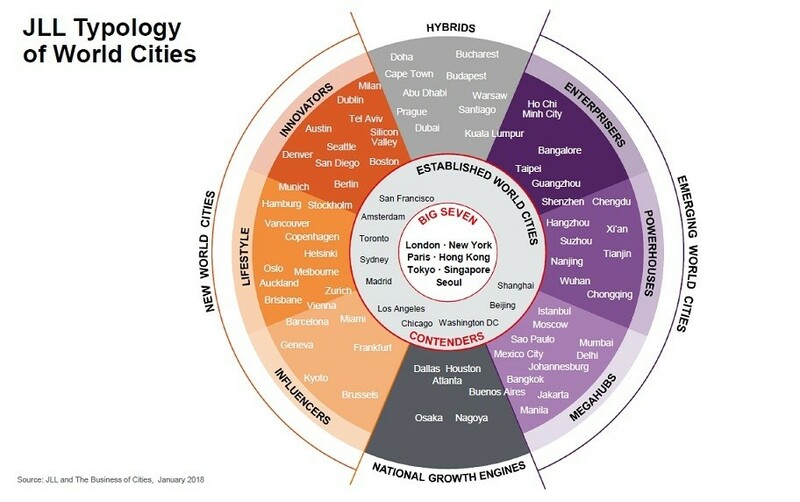 These are highly dynamic cities that have created their own start-up ecosystems and globally competitive companies, becoming magnets for domestic talent as a result. • Shenzhen has built on its reputation for hardware manufacturing to develop its own internationally competitive innovation ecosystem. Internet giant Tencent is based in the city, as are the global hardware firms of Huawei and ZTE. As a result, the city sees the third highest number of patent applications of any city in the world. As China’s capabilities grow, Shenzhen is likely to be at the centre of this. • Bangalore established itself as a popular destination for IT-related outsourcing, with successful home-grown companies such as Wipro and Infosys emerging from this context. Now, multinational companies are flocking to Bangalore to take advantage of the city’s research and development capabilities, including Google’s first R&D centre outside the US. New start-ups, such as e-commerce platform Flipkart and InMobi, India’s first unicorn, have emerged from the city’s entrepreneurial talent pool. The Innovators and Enterprisers both reflect the importance of innovation and technology-related strengths in 2018. The Innovators have been able to punch well above their weight by positioning themselves as specialist hubs and key nodes in important value chains. The Enterprisers have developed momentum by using the assets gained as centres of production and outsourcing, and harnessing them to create their own indigenous ecosystems of innovation. While we cannot be sure how well these cities will respond to new, disruptive technologies in the future, they have the essential ingredients and are well placed to continue their pathways to success. Click here for a full list of each city in each typology.